Enfield councils brief for Broomfield House had to accommodate many goals. Our team had to find a way to portray the fire ravaged house in every way possible in order to enroll the support of all those involved. 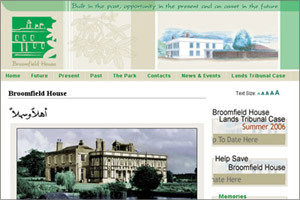 As designers of the SaveBroomfieldHouse site, our remit was to develop a brand new corporate image for Broomfield House and the campaign to restore the building.